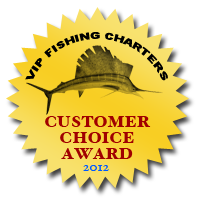 We can easily accomodate large groups on our Fort Lauderdale fishing charters and we have quite a bit of experience doing this. Due to United States Coast Guard regulations our Fort Lauderdale deep sea fishing charters are limited to six passengers per boat. If you have a large group, we will arrange for multiple boats to take your group out. We have a number of fishing boats in our Fort Lauderdale fleet so whether your 7, 12, 50, or 100 people, we can accomodate anyone. Many people are surprised about the 6 passenger limitation, because our boats appear large enough to accomodate many more than six. Unfortunately, the United States Coast Guard has imposed strict rules to protect the safety of life at sea, and only certain types of commercial boats that are specially designed for large groups can carry more than six passengers. One alternative to our standard Fort Lauderdale fishing charters for groups over six that want to be together is chartering a Fort Lauderdale head boat or party boat. The experience on one of these boats is quite a bit different from one of our private fishing charters on a sportfish. Fort Lauderdale head boats and drift boats are set up for drift fishing. That means the boat goes out, typically turns off its engine and everyone throws lines into the water. Don't get us wrong, this type of fishing can be fun and entertaining, but you likely won't have the chance to catch fun and exciting fish like sailfish, swordfish, mahi, and tuna, which require special methods and equipment that are impractical or impossible on drift boats. So our advice for most Fort Lauderdale groups is to split up into smaller groups and go fishing on a sportfish, but if your group or event requires that everyone be together on the same boat, we can help you arrange a private drift fishing charter. If you go the sportfish route and split up your group but want to creat a feeling of togetherness, we can arrange for a mini Fort Lauderdale fishing tournament, in which all the boats compete to catch the most fish or a certain type of fish, or some other fun and creative competition. The boats can stay in touch via radio contact and it can really make the group feel like one.